We all came back from the factory to the hotel, 5 of us crammed into a taxi (not including the driver). We spilled out of the taxi and into the lobby and briefly discussed the plan for the evening. 30 minute break then meet back to in the lobby to head out for dinner. I'm thinking "Yeah! 30 minutes practice time", one guy went to the gym, another guy got a hair cut, and the other two just chilled out. We all get in the lift and head to our respective 30 minutes of private time. Out comes the old man (15" viola, minus chin rest this time around). 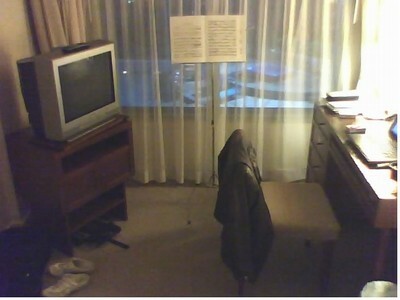 I set-up my practice space in the little free space I have in the hotel room, about a 3' x 3' clear area between the desk and TV. Dinner discussions were quite normal. My "partner in crime" (Adam) asked me about my practice time, and one of the young guys started making meowing cat noises. Adam gave him the "look" and said "you may make fun of it, but you've never heard her play, she's actually quite good". My face broke into a grin from ear to ear. He got to listen to me practice from 9pm to 5am during the last implementation we did last year. Then a small debate on who had to pay (HR policy is the most senior person) - did that mean age or position? The consensus was that in either case, I had to pay. Then the hunt for a taxi back to the hotel. I'm supprised that in a city-state such as Hong Kong it was so hard to find a taxi! Tonight, I was able to practice for 2 hours. My intonation hit the mark this time. It takes a few days for me to adjust from a 16" to a 15" viola. I'm really enjoying playing without a chin rest. It hasn't hindered my vibrato, in fact it got better (but that may be due to the smaller instrument). My 15" sounds less choked without the chin-rest. Could be that I just need a different one, but I don't know where to go shopping for viola parts here in Hong Kong, and I only have a few more days here before heading into China, so I'm chin-rest-less for now. "Then a small debate on who had to pay (HR policy is the most senior person) - did that mean age or position? " I started violin lessons again recently. The teacher didn't blink an eyelid when I told her I wasn't using a chinrest. I haven't used one continuously now for 1 1/2 years. When I got home I put the CR on again, just because I thought maybe it might be better that way. Nope. I took it off again 1/2 a day later. This amazes me. Even I thought I was kidding myself about the no chinrest thing. I wonder how long I'll go without it. I do seem to play better without it. I don't know why. Well, the housekeeping staff at the hotel just got a free concert. Didn't have to move into the hallway this time. But I bumped into the pillows that were placed on the TV and was asked to shuffle around a bit so the desk could be cleaned. Good thing I have this piece mostly memorized now.